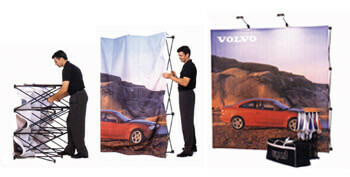 ReadyPop tension fabric trade show backdrop displays provide plenty of space for crafting and sharing a message and brand identity that captures prospective clients and draws them in to learn more about your products and services. Great for step & repeat walls! No catch: Prices include hardware, print, LED lights, all of it. Most convenient set-up & tear-down: Accordion-style frame opens and collapses down with the fabric print still attached to it. Its versatility and simple setup makes it functional for special events as well as an in-office promotional tool for walk-in customers. Makes for a great red carpet event step-n-repeat media wall. Available at 8ft, 10ft, 15ft, 20ft, even 30ft wide, as well as for the table top. Curved or straight options for the 8ft & 10ft systems.